By Mark - Argentina - 19 Oct/02 - Viewed 2260 times. We had to get up at 6am to fly from Buenos Aires to Ushuaia, the most southerly city in the world. The plane stopped in El Calafate on the way although we didn't know that until we boarded. This meant that the three and a half hour flight took about six hours. The landing at El Calafate was a bit rough - I think there was a strong cross wind. All the passengers still applauded though - they seem to do that here no matter how good or bad the landing is. Some of them started applauding even before we had started slowing down which I thought was tempting fate a bit. If we had gone off the end of the runway they would have felt very silly. We got to Ushuaia about 4pm and got a taxi to the town (A$5.00) as there is no bus. It is only five minutes round the bay. The taxi dropped us off outside the tourist information office where we got a list of accommodation. After Puerto Iguazu, we didn't want to lug our bags round looking for a hotel (it encourages you to take the first one you find) so Laura sat in a cafe with the bags while I went looking at the places on the list. After a few unsuccessful ventures in the rain and wind, Laura phoned one and got lucky straight away. It is a little guest house called Violeta de la Monta�a (Belgrano 238) which we would highly recommend. The lady who runs it was very friendly and spoke good English. It only costs A$12.00 per person, even if you have a double room (no bathroom). This includes breakfast and you can use the kitchen. We were feeling so good about having cheap accommodation that we decided to go to an expensive fish restaurant for dinner although the meal was a bit disappointing. The next day, we were booked to go on the standard boat trip round the local islands to see the sea lions and penguins (A$50.00 each). We had booked in a travel agent in the high street although we later found out that down by the port there is a little group of huts owned by the operators themselves where there is much more choice. There was no mention of the port tax until we arrived at the port (A$3.60 each). However, our boat was cancelled, so we had to quickly find another one (all the trips leave at 3pm). We walked back to the hut village and the first operator to approach us (Tres Marias) was running a longer trip that included a trek on an island so we took that. It was slightly more at A$60.00 but was four hours instead of two and a half. Looking at all the huge catamarans docked nearby, we wondered which we would be taking. Instead, the tour operator lead us round the side of the port to a tiny fishing vessel that was moored two boats out (so you had to climb over other boats to get to it). It could only hold 10 people (3 crew, 3 Argentinian tourists, a Frenchman, a Dutchman, a Spanish lady and us). We were a bit dubious about the size of the boat, but by the end thought that it was much better than taking one of the bigger boats would have been. There was a good atmosphere on the boat, and some of the other passengers were able to translate what was going on for us and the Dutchman (the others all spoke Spanish). On the way out we saw a solitary penguin swimming by. The first stop was the sea lion colony, the little boat was able to get much closer than a big one would have been able to. The crew made sea lion like barking noises which started the sea lions barking (well, a cross between a moo and bark). 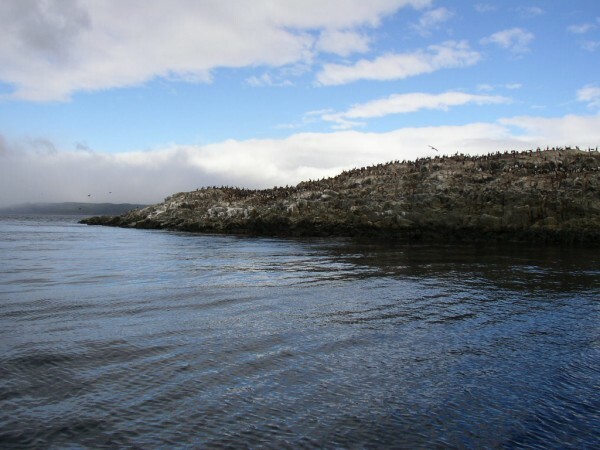 Next stop was a King Cormorant colony, and after that a stop on H Island (called that because of the shape). From the boat it looked like a big barren rock and I wondered what there was to see here. We got out of the boat and climbed up the rocks onto the island. One of the crew started telling us about the different plants and about the native Indians who used to live on the island. Apparently they didn't wear any clothes, because it was warmer than having wet clothes. They all died out when the Europeans discovered the area and made them wear clothes and live in houses. We then walked to the windier, west side of the Island where you could approach to within about five metres of some King Cormorant nests. The birds didn't seem to notice us photographing them. It was a beautiful little island and we were very pleased that we came on the trip that stopped there. When we returned to Ushuaia, it was snowing heavily and already settling. This made the town even prettier, so we retired to the chocolate shop to have a hot chocolate and watch the snow. Tomorrow we are flying to El Calafate which is the last of our prepaid flights. From here on it is pretty much overland all the way north through South and Central America to L.A. It looks a long way on the map. The worlds most southerly train. For tourists only - we thought it was too expensive.